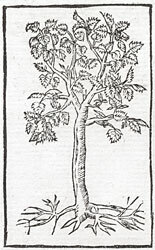 Alciato at Glasgow: Emblem: Morus. Section: ARBORES (Trees). View all emblems in this section. Germinat: & sapiens nomina falsa gerit. On the other hand, the mulberry is late, and never until the frost is past does it shoot; though wise, it bears a false name. 1. See Pliny, Natural History, 16.25.102: “the mulberry is the last of domesticated trees to shoot, and only does so when the frosts are over; for that reason it is called the wisest of trees”. 2. nomina falsa, ‘a false name’, reference to a supposed ‘etymology by opposites’: Latin morus ‘mulberry’ was equated with Greek μῶρος ‘fool’, but the tree was considered wise: see note 1.